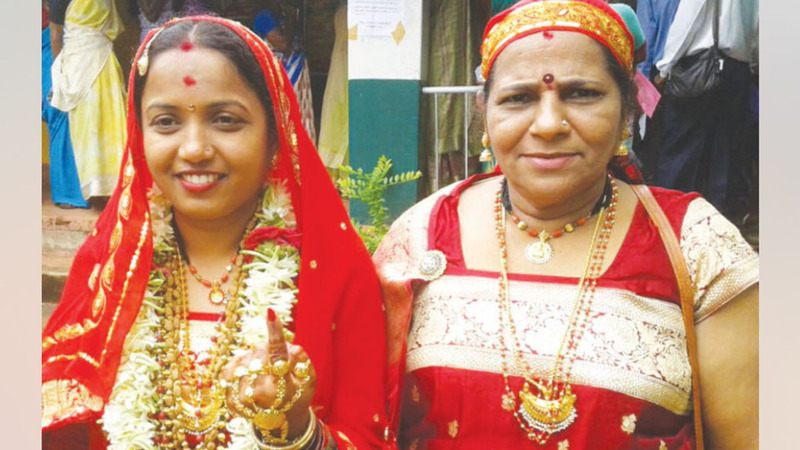 Madikeri: The polling booth staff and other voters at polling booth 131 located at Kandanakolli School were surprised to see a woman gorgeously dressed in a bridal attire entering the booth to vote along with her mother yesterday. The woman was Smitha of Kandanakolli village whose marriage was arranged with Praveen of Moovathoklu village at Gowda Samaja in Madikeri to be solemnised yesterday only. Not heeding to the advice of her family members and relatives, Smitha was said to be firm on exercising her franchise first before entering wedlock. Her determination won and Smitha after voting went to the Kalyana Mantap and participated in the marriage rituals. Smitha felt happy that she had broken the tradition for a worthy cause to exercise a democratic right.